The NetApp Cloud First Partner Program is a channel program for new and existing partners who are looking to help their customers implement architectures in public cloud environments in Microsoft Azure, Google Cloud and Amazon Web Services. NetApp Cloud Data Services as part of your cloud recommendations to your customers. 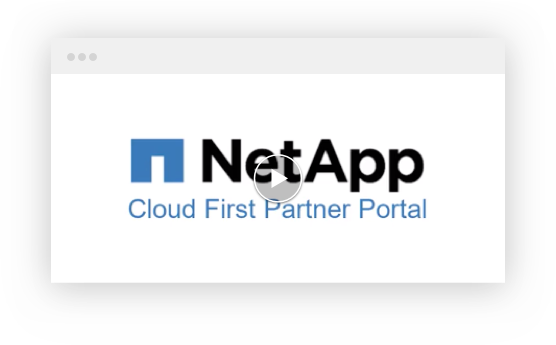 NetApp distribution partners or subscriptions purchased directly through public cloud marketplaces. NOTE: Standard partner margins apply. * Partners request deal incentives through Cloud First Partner portal per deal. *Access to discounted prices via AWS CPPO. Learn more HERE. Read Blog. Learn the steps involved with becoming a Cloud First Partner. Select each cloud environment to see details. Discover the tools available to you as a Cloud First Partner. If you are an established Cloud Partner, now is your chance to close more deals with the premier data management and services leader in the industry. Sign up now and join the exclusive ranks of our featured partners.